The Zip Yard » 24 Hour Oscars Challenge For RTE Today! 2017’s Oscars ceremony will forever be etched in our memories as the year of ‘the fiasco’. But as the investigation wraps, the scandal fades and resignations are submitted, we’re choosing to remember last week’s awards ceremony for all that was great about it: the dresses. The Oscars being the final stop on the awards circuit it always garners the most interest from the fashion commentators; the style choices discussed for years to come. From full and wide to slinky and sheer, the array of gowns was as varied as it was appealing. There were those who took risks and those who went classic. Either way, and everywhere in between, there was plenty of sartorial drama on the red carpet long before there was any on the stage. And what of the lead up to the show-stopping entrances that these gowns allowed? How much work goes into making that happen? Awards season dresses are big business; the Oscars dresses are the biggest of all. The red carpet arrival has become a much-coveted global platform moment that is planned meticulously. There are publicists, agents, stylists, designers and actresses, all plotting and executing ‘the vision’. This involves months of preparation. The gowns are works of art, showcasing the most skilled of craftsmanship and design, using the most coveted and rare of fabrics. The time involved in creating these iconic pieces is lengthy and precious. So imagine trying to recreate any of these bespoke, couture pieces in say, 24 hours? Madness. Recreating 3 of them in that time? Impossible! Well, impossible if you’re not The Zip Yard, perhaps. 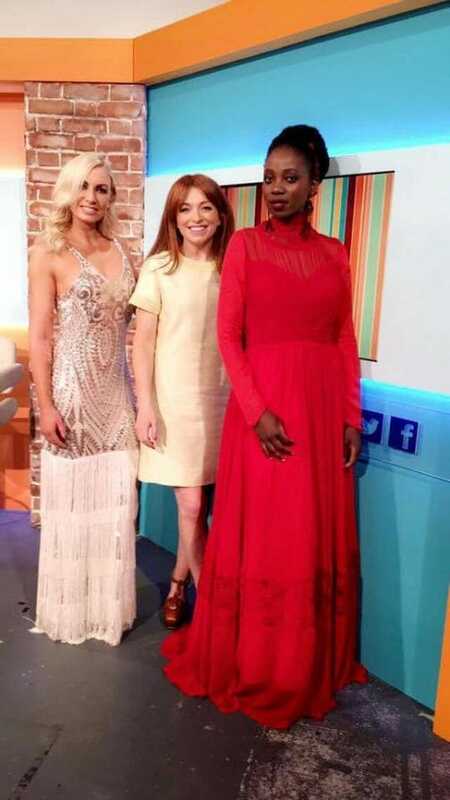 Because that is exactly what we got up to this week, accepting the most demanding of challenges as set out by the RTE Today show: recreate the top 3 Oscars dresses in just 24 hours from the time they hit our TV screens. And so Oscars night came and the usual excitement of watching the red carpet live late into the night was mixed with trepidation and excitement as we monitored the arrivals. As each of the actresses whose style we would go on to emulate arrived, it was clear who the winners were in our eyes. And weren’t they exquisite? 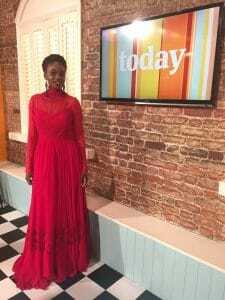 Ireland’s own was a vision in her long sleeved red custom Valentino gown, accessorised with an Irene Neuwirth crown and Gemfields ruby earrings. Nominated for Loving, this had been Negga’s time to shine both on and off the screen. The fashion world has fallen in love with her unique and daring style. 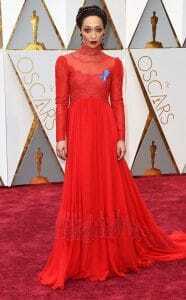 Her Oscars choice didn’t disappoint: instead of daring to bare she dared to cover, in dramatic, exquisite style. Emma Stone looked every inch the Best Actress winner as she arrived to unveil what may have been the most anticipated look of the Oscars Red Carpet. Having charmed us with her feminine mid-century influenced costumes on La La Land, she didn’t disappoint with her statuesque style on the biggest night of all. Wearing a Givenchy Haute Couture gown, finished with 20s flapper fringing the eventual overall winner resembled the very Oscar she took home with her. She was glorious in gold. A consistent style favourite, Michelle Williams was in anything but a supporting role as she arrived in her Nicolas Ghesquière–designed Louis Vuitton gown: a black velvet halter with heavily embroidered skirt, the fabric moved exquisitely with her body and epitomized understated elegance. The Manchester By The Sea nominee is said to have drawn inspiration from actress Jean Seberg, adopting a distinctly French approach to styling by pairing back the accessories and allowing the dress make the statement. And so, having identified our Oscars ‘most stylish’, the challenge got under way. The first undertaking was to source those dresses that would become the basis of the Oscars’ recreations. Not far from our Zip Yard, South William St. store, Oxfam Bridal on George’s St proved the perfect treasure trove. Here we discovered three bridesmaid dresses that we deemed ideal for our restyling. With the ‘before’ dresses in our hands, we began to plan the execution, identifying any further fabrics required and those extra little touches that needed to be purchased from the haberdashery store. Attention to detail was paramount. For Ruth Negga’s recreation, the dress was completely remade from the waist up. The team added sheer chiffon to the bust-line and the sleeves. Lace was also added to the bust-line and neckline to give the high-neck Victoriana feel. On the skirt of the dress, we team cut a foot up from the ground, inserting a red lace panel to the bottom section. They then reattached the original fabric, dropping the dress 4 inches, making it a longer, dramatic finish. For Emma Stone’s recreation, our team began by completely removing the sleeves. They then turned the neckline into a sweetheart neck. Creating straps from the originally removed fabric, they then added these straps to the body of the dress. Next, they closed the slit on the dress. Emulating the 20s flappers style on the original piece, the team added four layers of fringing to the end of the dress. This fringing was hand-dyed by the team for the purpose of the challenge (but this isn’t a Zip Yard service). Michelle William’s recreation began by totally removing the top of the dress. This halter-neck top was then completely remade in black stretched satin. Michelle’s original top was very daring with a deep plunge. The Zip Yard designers emulated this whilst keeping in mind the Irish ladies’ tastes and slightly crossed the fabric for increased modesty. The original ‘before’ skirt was then overlaid with a sequined mesh fabric, finishing the recreation to perfection. Each of these dresses were unveiled during Tuesday’s Today show, with much celebration by the entire crew. Everyone was blown away by the recreations, and incredibly impressed by the speed at which the restyling was achieved. So there you have it: Oscars challenge accepted. Oscars challenge conquered! Any dress is achievable if you give yourself the time to have it made. The Zip Yard team will have a full personal consultation with you. They will look at your inspiration – be it a celebrity magazine image, a Pinterest pick or a complete pattern – and they will discuss fabrics and finishes, advising on everything from your body shape to the best fabric for the desired finish. The team will fully guide you through the process, understanding how important the piece is to you. They get it! The Zip Yard have 27 stores nationwide, with The Zip Yard Cork now in a brand new location on North Main St. Each of The Zip Yard boutiques is located on a ground floor, high street locations with large, private fitting rooms for those personal consultations. The Zip Yard team can also copy an existing piece to create a brand new garment. The Zip Yard also offer a quick 48-hour turnaround service for regular alternations, as well as a 1-hour express service for minor alterations or repairs. Customers can benefit from a loyalty point system. They will also receive a text message on completion of their garment which ensures they can collect it as soon as it is ready.